Welcome to Bruce Outridge Productions offering custom illustration and design services to clients in Burlington, Hamilton, Niagara, Mississauga, Brantford, Kitchener, Guelph, London,Toronto, Richmond Hill, Markham, Oshawa, Ottawa and other areas of Southern Ontario. 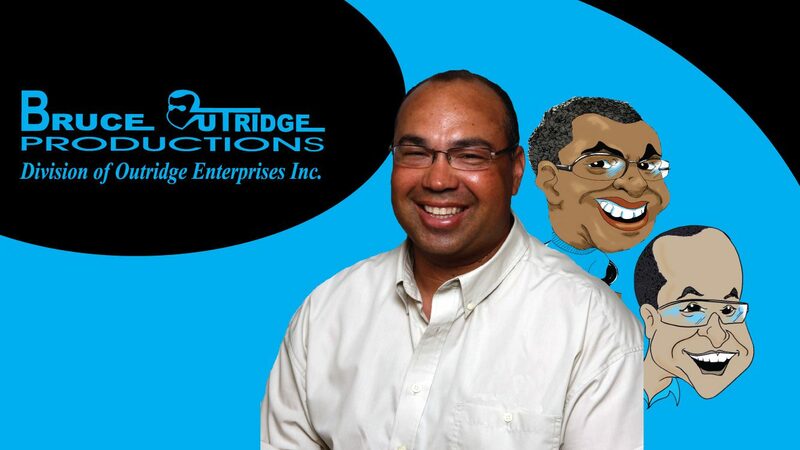 Bruce Outridge Productions is a custom illustration and design business specializing in caricatures and cartoons and services range from live caricature entertainment to illustration, logo design, gift caricatures, art instruction, speaking, and more. You can view all pages and information on this website by clicking the MENU button at the top right of this page or the quick links below. Get a quote on your next project or event today! This was such a amazing addition to our wedding reception. Something different. Bruce was great from beginning to end, and I would recommend him in a heartbeat. Bruce was one of the highlights of our wedding! We had so many compliments from our guests on having such a unique entertainment idea. The selfie cam photos and gift caricature are great keepsakes from the night as well. Also, Bruce is the NICEST man! We would highly recommend him! I booked Bruce for a 50th birthday party. We did the digital caricature package. Bruce is a true pro, he came prepared with all the required equipment within plenty of time to get set up for our guests. Everything was fantastic – from the artwork to the witty banter Bruce had with the guests. As a corporate event planner I work with a lot of suppliers (good and bad) and I have to say I would without a doubt hire Bruce again. He is a absolute professional! Thanks again for making our party so special! Bruce attended our kids Xmas party and was a huge hit with the kids and adults alike. He worked tirelessly for 3 hours straight drawing outstanding caricatures. He is very outgoing and friendly and I would certainly recommend him to add an entertainment feature to your event. Very humorous individual…Had a great time and the cartoon drawing was fabulous! :)Bruce was fantastic. He made you feel very welcome and he did a great job. Would definitely consider booking him again.